Raise your hand if the idea of teaching your students data analysis and statistical thinking is a little unsettling for you. For many of us who teach social studies, history, language arts, and (yes) even science, it has been a very long time since we took a course in statistics. For many, statistics is a scary label. Even fewer of us have ever had training in how to incorporate statistical thinking into curriculum for young students. Yet assessments and standards expect our students to analyze and interpret data and make compelling arguments from evidence. Yikes. The good news is that statistics educators and education researchers, and Tuva, promote an initial exploratory approach to learning how to think statistically about data. Research finds that students have lots to say about data once they have tools, opportunity, and guidance to explore data informally and reason about the stories they find. Quantitative, or “Confirmatory” statistical analysis comes later, once students grasp challenges of making informal inferences about groups and attributes that are variable. In Exploratory Data Analysis, students first learn to recognize and talk about variability, and how variability and certainty are related. They learn to explore data, make informal claims, and develop language for describing their data. If you feel hesitant about guiding students in data analysis, you are not alone. Many of you have asked for some kind of “orientation” for students starting out with data on Tuva. 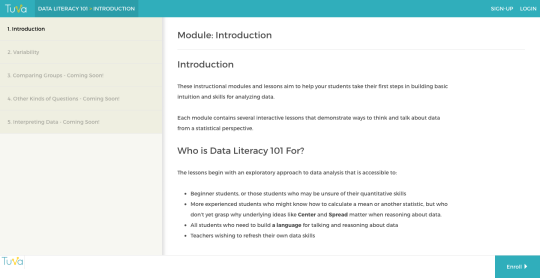 Today, we are excited to launch Data Literacy 101, a course with modules and lessons designed to establish fundamental exploratory data analysis skills (“Level I”). In the coming weeks, we will add lessons that scaffold students in more quantitative analyses (“Level II”), that then launch them into a grounded and integrated approach to analyzing data as evidence (“Level III”). Data Literacy 101 lessons incorporate pre- and post-assessment questions to help identify gaps and gains in learning. Lessons are tagged to identify relevant data literacy standards. Follow-on activities will give students practice in skills just learned in a lesson using datasets tagged by content area. In addition to building students’ skills, Data Literacy 101 is a useful reference if you want to refresh your own familiarity with basic statistical concepts and tools and language. Data Literacy 101 can help you and your students experience the fun of playing with data and telling the stories they find. Let’s get started! We have made additional updates to the Filter Bar on Tuva Datasets, following up from our announcement a few weeks ago regarding a more powerful Filter Bar. Now, you can filter for Tuva Datasets and activities by a specific Common Core Math Standard, Domain, or Topic. The CCSS-related Filter categories include: Comparing Groups, Correlation, Comparing Data, Linear Equations, Modeling, Quantitative Relationships, and many topics and standards. In addition, we are continuing to extend our coverage of the Next Generation Science Standards, and have curated a number of fantastic new datasets covering additional NGSS Physical Science, Life Science, and Earth & Space Science standards. To learn more, explore all the datasets in our Tuva Datasets Library. Remember, you can always reach out to us if you are unable to find a dataset for your needs.